"In the dark of waking, a soul has died." This book was included in Book Riots Quarterly Box 3 (BK03), the theme was "Expand Your Reading Horizons". I love that they sent books to change reading habits up a bit. I do like fantasy and sci-fi so this particular book wasn't TOO far out of my comfort zone but I don't devour the genre like some. 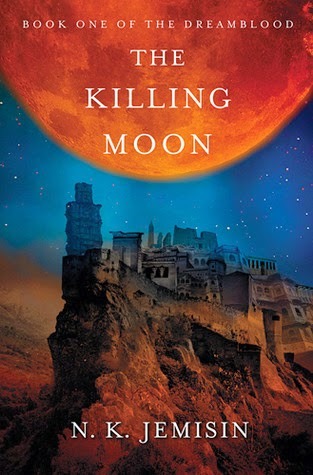 The Killing Moon is a great selection for those to expand their "reading horizons" because it's unlike any fantasy/sci-fi book I've ever read. It doesn't take place in Medieval times (thank dog), but in a world of it's own... one that the Author has developed on a grandiose scale. The beginning of the book is hard to get involved with, imagining and connecting with a entirely made up world can be daunting for a reader. Once you start feeling the flow, it was smooth sailing and hard to put the book down. Jemisin has a fantastic imagination, wheweee, one you clearly become engulfed in from the beauty and awe inspiring scenes she weaves. I feel this world truly exists, out there somewhere... and since this book is all about dreams, I'll go cliche and say I wish it existed outside of my reading dreams. I'd like to give you a great synopsis of the book but I think it would come out as mumbo jumbo due to the complicated world built around it. I can try though... feel free to laugh, I'm sure this will be funny. So... there's this group of people called the "Gatherers" who worship this idea of a goddess sun called "Hanajan" (I hope I got that right), and these "Gatherers" are kinda like priests. They gather magic dreams from corrupted people in their sleep, this stuff they gather is known as "dreamblood". Which they then store this "dreamblood" away for use to heal those injured citizens of Gujaareh. On the other side of this world (well maybe not that far) there lies a group of people who have detached themselves from the Gujaareh, believing that letting people live out their life and die naturally is better. The reader gets to follow both groups with their ideals and learn about some controversial topics that delve into life, death, pain, mercy. I enjoyed and could agree with both sides of the argument and found it really interesting that the Author was able to take this topic and bring it into her make believe world. So... that's a good enough background for you. I think many people could read this, even the ones who don't think fantasy is something they'd like... this is a good one to use as a test. The storyline, characters and world is completely out of the box and different, making this book hard to place into a specific genre. I'd love to hear what you think. I'd also like to thank Book Riot for expanding my horizons, I don't know if I would have picked up this book otherwise.